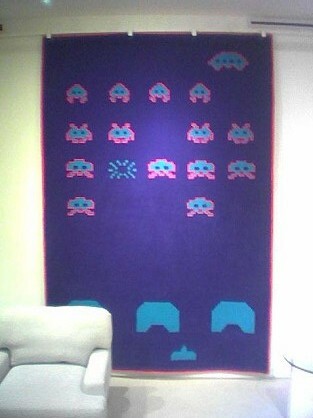 Want a rug that's modern and retro? This Space Invaders piece should do it. Playing with this rug will cost you $3,000. This rug is made by Dune in New York. The owner told me that they called Taito (creator of Space Invaders) to ask permission to manufacturer it, and were given the go ahead with no need for a licensing fee or royalty payment. This was taken at Dune in New York, N.Y.